According Stefania Duico, the lead of Windows Phone Italy, the Windows Phone Tango update will be officially called 7.5 Refresh. As you probably know, currently WP Mango is called just 7.5. Adding the Refresh moniker and not changing the OS version actually makes sense, because this update major role is to lower the Windows Phone specs so less-capable devices could run it (without multi-tasking, live tiles, etc.). The update will become available for every WP-based smartphone out there later this year. The next major release is Apollo a.k.a. Windows Phone 8. It will probably launch in Q3 this year. Offerings from both Nokia and ZTE debuted the next major build of Windows Phone last week at MWC, dubbed “Tango”. The new Nokia Lumia 610 and ZTE Orbit both took to their respective stands to show off the new lower-end capabilities of Microsoft’s mobile OS. Despite the latest iteration (excluding Apollo) of Windows Phone having made it to these devices on the floor at MWC, Microsoft had been particularly vague about just what the limitations were for devices employing lower-tiered hardware, until now. • Windows Phone Marketplace app restrictions – Some processor-intensive apps have particular memory requirements, and won’t work on phones with 256MB of RAM. • Podcast/Video Podcast Subscriptions – Managing podcast subscriptions or watching video podcasts on a device with 256MB of RAM will not be possible. • Bing Local Scout – Bing Local Scout won’t feature on a device with only 256MB of RAM. • Fast app/Task switching – The feature differs on Windows Phones with 256MB of RAM in that if a single application uses over 90MB, it will be killed on exit and thus not appear in the task switcher, besides this the functionality will remain unchanged. • SkyDrive automatic photo upload – 256MB of RAM means no auto-upload option, but users will still be able to upload their photos manually. • HD video playback – Some compressed videos will be unable to play due to a lack of codec support on devices with 256MB of RAM. • Background agents – To free up RAM for the foreground on such devices, generic background agents (PeriodicTasks/ResourceIntensiveTasks) will be disabled. As well as informing prospective buyers of these new more competitively priced Windows Phones what they’ll be missing out on, Microsoft have also made a point of appealing to Windows Phone developers who will need to take into account the limitations of devices using the new minimum hardware requirements. Speed seems to be key with a message of optimizing app start times and reducing an apps’ memory footprint being pushed to developers. All this being said, Microsoft are adding features to Windows Phone 7.5 too, including a new location alert, MMS enhancements and improved SIM contact management. Windows Phone “Tango” should be arriving on 256MB of RAM-endowed Windows Phone devices come Q2 this year. HTC didn’t win the race for selling the most Windows Phone 7 devices, but the Taiwanese have won the race to China. The winner in this race happens to be the HTC Titan, which debuts in the Chinese market as HTC Triumph. Priced at ¥4,399 ($700) without the burden of a contract, the 4.7-inch Titan takes one of the top spots in the high-end smartphone market in the People’s republic. 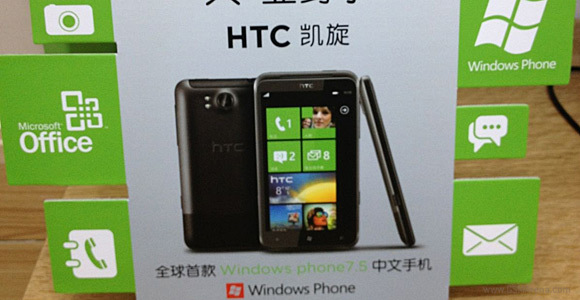 HTC has confirmed that the Triumph will ship with the latest Windows Phone 7.5 Tango. However, Facebook and Twitter applications will be replaced by the local Sina Weibo and Tencent Weixin. Naturally, SkyDrive will take care of the cloud storage uploads.